Research Report: "Banking market in Poland, 2017-2019"
Banking sector. Banking volumes have continued to grow fast during 2016, despite relatively unfavourable regulatory environment. Deposits of non-financial clients at banks recorded a strong 11% YoY increase to nearly PLN 1.1 trillion while lending increased a bit slower, at 5% YoY to PLN 1.11 trillion. The growth of volumes was balanced across all client segments, however, retail deposits advanced particularly fast. 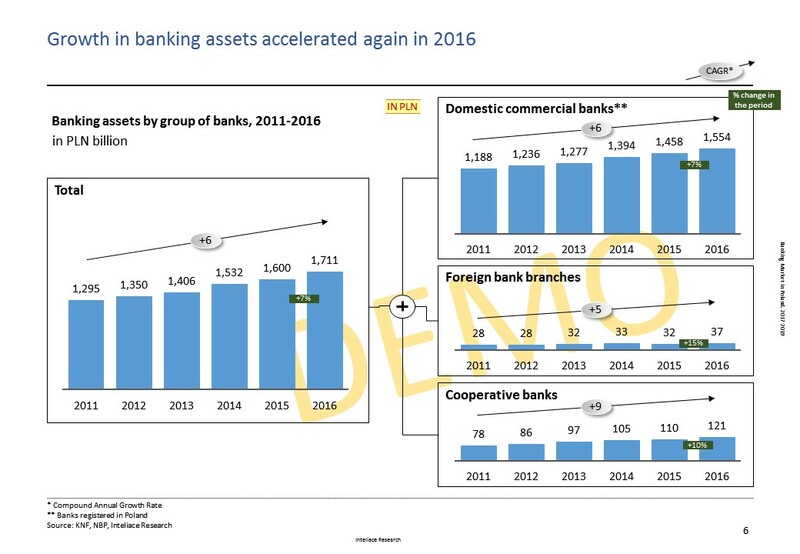 As a consequence of growing key volumes, total banking assets increased by 7% YoY to a record of PLN 1.71 trillion as of December 2016. Slide 49: Innovation in payments – digital wallets /mobile payments: MasterPass, PayPal, Visa, PKO IKO, BLIK, PayU, SkyCash, mPay etc.